Shang dynasty kings ruled over a well-organized and civilized state in northern China between 1766 BCE and 1122 BCE. Under them, many of the key features of later Chinese civilization began to develop. The Shang dynasty was, according to traditional Chinese histories, the second dynasty of ancient China, ruling from 1766 BCE to 1122 BCE. The dynasty was held to have been founded by a rebel king, Tang, who overthrew the last king of the Xia dynasty, the first of ancient China’s dynasties. To date there has come down to us no direct historical evidence for the existence of the Xia dynasty. However, there is no reason why such a dynasty may not have existed in China’s pre-history. Given that the roots of Chinese civilization go much further back than the Shang, there are plenty of reasons to think that the Xia dynasty did indeed rule in northern China. For centuries prior to the rise of the Shang dynasty, the farming culture of northern China had been advancing in social complexity and technological sophistication, for example with the introduction of wheel-thrown pottery. By c. 1800 BCE, knowledge of bronze casting had entered the Yellow River Valley from western China, as is shown by the bronze bells and other objects found in late 3rd millennium sites. During this period, walled towns grew dramatically in size and density. The earliest-known city in ancient China appeared in c. 1800 BCE, at Erlitou, just south of the Yellow River. In the early 2nd millennium BCE, what had been a fairly typical walled town of the period suddenly mushroomed into a city some 300 hectares (741 acres) in area (about ten times the area of earlier settlements in the region). This change on the order of magnitude of settlement size was accompanied by other changes, such as the appearance of elaborate elite burials, ritual bronze vessels, and the presence of two palaces. Erlitou is only one urban site amongst several dating from this ancient period of history. Sharp social divisions were increasingly apparent, and the power and status of rulers is shown by the occurrence of human sacrifice – always a sign of overwhelming, usually sacred authority – as well as by magnificent graves. It is clear that warfare became much more prevalent during the early 2nd millennium BCE, presumably the result of population expansion. Throughout history, success in war has always been dependent upon good organization as much as military valour, and this was clearly an age in which tribal chiefdoms were being transformed into proper kingdoms. In these, the kings and their officials were able to exercise control over comparatively wide areas, collecting sufficient tribute from the farming population to pay for luxurious courts where power was concentrated. These courts were serviced by specialized and highly skilled craftsmen – the range and quality of the bronze vessels recovered from sites of the period is staggering, appearing so suddenly in the archaeological record. These court centres, with their temples and palaces, were surrounded by sizeable towns and cities, enclosed by stamped-earth walls and moats. One of these early kingdoms – in all likelihood that of which Erlitou was the capital – was probably ruled by a dynasty which later generations called the Xia. This state would be the forebear to all the great dynasties of Chinese history that followed. If traditional Chinese historiography is followed, the Xia kingdom was conquered in c. 1766 BCE by a ruler of a neighbouring state which was subordinate to the Xia. This ruler was the founder of the Shang dynasty. The resulting kingdom became the most powerful state in northern China. The heartland of the Shang kingdom lay where the Yellow River leaves the mountains and enters the eastern plains. This is an extremely fertile area, due to the soil deposits brought down by the river system from the mountains. It is also conveniently situated near metal-rich deposits in the uplands. Under the Shang, ancient China emerges into the light of history. Written records, mostly in the form of inscriptions on oracle bones, or on pottery or bronze vessels, shed light on the society and politics of the period. The Shang script was a fully developed system of writing, similar to that still in use on China today. The Shang kings were, like many rulers of the ancient world, high priests as well as political and military leaders. As the oracle bone inscriptions reveal, one of the main functions falling to the king was to offer sacrifices to his royal ancestors; and he also led the worship of the high god, Di. The king was assisted in his duties by a staff of literate scribes, headed by officers who had titles which reflected specific, departmentalised responsibilities. The Shang royal precinct, with its palaces and temples, functioned as much as a religious ceremonial centre as a centre of government. It lay at the centre of the royal capital, with its workshops and houses, and the whole surrounded by a stamped earth wall. Outside the capital were the villages in which the majority of the people lived. Most of these people were peasants, farming small plots of land. The land was owned by the king or by local lords; in exchange for being allowed to farm these plots, the peasants had to give part of their crops as tribute to their lord, and were also required, when ordered, to follow their lord to war, or to work on a project which he wanted carrying out, such as digging a pond or canal. Further away from the capital and the land which immediately surrounded it, which was controlled directly by the king, the Shang kingdom was partitioned amongst many such local lords. These lords all owed obedience to the king, and they had to see to it that the people in their area obeyed the law, and that tribute owing to the king was collected and sent to the capital. The lords also provided soldiers for the royal army from amongst their peasants, as well as labourers for the large projects which the king ordered to be carried out from time to time, such as building temples or royal palaces. The lords also had the duty of advising the king as to what policies he should follow. This inner area of subordinate lordships was surrounded by an outer ring of semi-independent kingdoms and tribes who owed the Shang king some form of loyalty. Kingdoms and tribes which were defeated by the Shang had to submit to them. Sometimes the Shang king took some or all of their territory away from a defeated ruler and gave it to his own followers to control. At other times defeated rulers were allowed to keep their land. However, they had to go to the Shang capital, and bow down to the Shang king as their overlord. In return, they received badges of office, and were allowed to govern their territories as long as they remained loyal to the Shang. 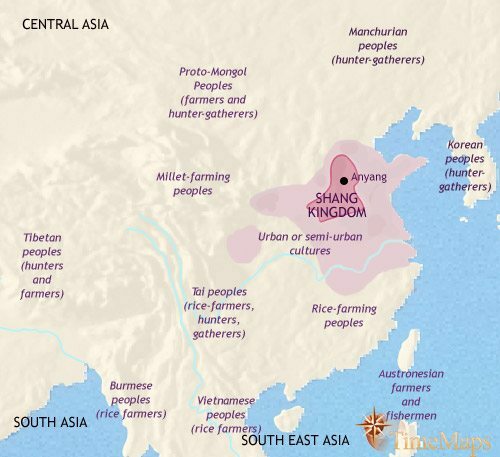 The Shang state therefore came to be made up of different zones. In the centre was the capital city itself, and its surrounding countryside. The Shang king controlled this area directly. Surrounding this central area was the rest of the Shang kingdom, which was divided into many localities, each controlled by a subordinate lord. Finally, there was a large outer territory of kingdoms and chiefdoms which acknowledged the Shang king as their overlord. When required, these would send soldiers to fight in the Shang army. The Shang kingdom can best be seen, therefore, as a confederation of states clustered around a central domain, owing greater or lesser obedience to the Shang king. This confederation covered much of northern China, reaching at times into the Yangtze Valley. At its peak, it must have been a formidable power, with the Shang king able to muster troops from a very wide area, in addition to the army recruited from his own domain; and, waxing and waning in size, the Shang confederation endured for several centuries, witnessing to an impressive inner cohesion. The Shang kings shifted their capital from time to time. Archaeologists identify the city of Zhenzhou with one of the first capitals of the Shang dynasty, probably the capital traditionally known as Bo or Ao. This city represents a step up from Erlitou in terms of size and material culture. With its extensive suburbs it covered 25 sq. km. (9.7 sq. miles). At its centre lay a moated palace, near richly-endowed graves for the ruling family which contained beautifully-crafted bronze ritual vessels and jade and bronze ornaments. The city centre was enclosed by stamped earth walls, reaching a width of 36 m (118 ft) at the base, and probably dating to c. 1650 BCE. Outside these walls were workshops for bronze, bone and ceramic work; homes for the specialist craftsmen employed in them; and other residential areas. The Shang period saw great advances in craftsmanship, a response to a demand for sophisticated goods from a wealthy and privileged governing elite. Zhenzhou was superseded as capital by the city uncovered at Huanbei (probably ancient Xi’ang). Here, a huge palace precinct in the centre of the walled area incorporated at least 25 individual buildings. The final Shang capital of Anyang was roughly the same size as Zhenzhou. The centre contained the normal palace precinct, complete with ancestral temples. In the royal graves, jade ornaments and ritual objects abound. Some of the graves contained complete light two-wheeled chariots. The Shang army fought frequent wars with neighbouring barbarians, including nomads from the inner Asian steppes. Inscriptions on oracle bones repeatedly express anxieties about such barbarians, who lived beyond the frontiers of the civilized world of the Shang and their allies. It seems that the Shang kings maintained a force of about a thousand troops at their capital and would personally lead this force into battle. When a larger force was required, the king called on his nobles to raise troops from their territories and contribute them to the royal army. The lords were obligated to furnish these troops with all the necessary equipment, armour and weapons. Subordinate kings and chiefs would also be asked to contribute contingents. In this way the Shang could quickly muster armies more than ten thousand strong. Most of these troops would be peasants conscripted as soldiers for the duration of a campaign. They would fight as infantry, armed with a variety of stone and bronze weaponry including spears, pole-axes, composite bows, and leather helmets. Bronze weapons and armour would be limited to the nobility, as these were far to expensive to equip the ordinary troops with. Military – A bronze axe of the Shang dynasty. Chariots, as well as being efficient weapons of war, functioned as mobile command units. They became indispensable weapons of war, against which infantry troops found it very hard to stand. Fighting effectively as chariot-borne warriors required a great deal of training, the time for which only aristocrats could afford to give. Thus later Shang warfare would have depended even more upon the military skills of the nobility than in previous times. The late Shang period is famous for the oracle bones used for divining the future. Some 100,000 of them have been recovered from the period. Kings, officials and others would have questions written onto bones or shells, which would then be heated. Priests would then study the cracks formed by the heat and interpret them to give the questioner an answer. Oracle bones have been found from eras preceding the Shang, though without the questions and interpretations inscribed on them. The very existence of these oracles show that divination was already a well-established practice by the time literate civilization developed in China. The interpretations shed invaluable light on Shang politics, religion and society. Hunting, war, rainfall, the success of the harvest, the health of members of royal family – these were the predictable concerns of the Shang rulers. By the time of the oracle bone inscriptions which have been discovered so far, Shang political power was in decline, and a sense of anxiety and threat can be detected in many of the questions which had been put and the written interpretations given. The texts also show that the veneration of ancestors was also already a key element within Chinese culture. Another indication that many elements of modern Chinese thought were already present in Shang times was that the royal graves were aligned in accordance with the ideas of Sheng fui. There were therefore clear continuities between thought and religious practices at this early stage in China’s history and with those of later periods. However, there were also differences. One feature of Shang religious practice (as elsewhere in the Bronze Age) was human sacrifice, which was practiced on a large scale by the Shang royal court. This fell out of common use under the Zhou dynasty. Another difference was that the king sacrificed to the high god, Di, responsible for the rain, wind, and thunder. It seems that Di’s importance in the religion of this period was more important than it would later become, when the more impersonal concept of “Heaven” became dominant. The economy of the Shang kingdom was, as with all pre-modern economies, based on agriculture. By far the majority of the population were peasants who worked by farming the land. The peasants worked the land, but the land was controlled by lords to whom the peasants contributed a large share of the crops they grew. The peasants were also called upon to perform a range tasks such as building and repairing dykes to prevent erosion or protect against flooding; digging ponds and channels for storing and directing water to where it was needed, and so on. To do these things the peasants had to work together in large groups, which had to be supervised by village headmen and overseers for the local lords. They also had to fight in the royal army or work on major royal projects should their lords require them to do so. The lords lived in far greater luxury than the majority of the population. They spent their time in administering their lands, in training for war and fighting on campaigns, in attending the king at court, advising him in matters of government and assisting him in religious ceremonies, or in presiding over the rites to do with their own ancestors. They may also have been involved in the worship of local deities whose existence has long been forgotten. Apart from the peasants and lords, there were also groups of people who lived in the capital and were attached to the service of the king and his court. One group was made up of scribes or priests. These played a key role in the religious rites of the kingdom, and must have enjoyed a high social status. Other groups were the bronze workers and other skilled craftsmen who produced the fine objects which adorned the palaces and temples; and the labourers – possibly slaves – involved in the mining, refining and transporting of the tin, copper and lead ores which went to make bronze. The Shang kingdom lay at the centre of a network of long-distance trade routes. This is shown by the cowrie shells which served as a unit of currency. All were imported, some from tropical seas thousands of kilometres to the south. Turtle shells used for divination purposes, as well as the jade used in ornamental objects, are also imported from the south. Exactly how the traders fitted into society is unknown, but it is likely that some were closely associated with the royal court, perhaps even royal servants. As we have seen, the Shang dynasty kingdom did not form a unified state structure covering a large area of China. Even in northern China there were many other kingdoms and tribes. Some of these were long-term allies of the Shang; others were at times allies, at times enemies, of the Shang. Others lay mostly beyond the reach of the Shang. Shang cultural influences, however, spread far wider across China. The Shang kingdom lay at the centre of a network of long-distance trade routes. This is shown by the cowrie shells which served as a unit of currency. All were imported, some from tropical seas thousands of kilometres to the south. Turtle shells used for divination purposes, as well as the jade used in ornamental objects, are also imported from the south. The rice-growing region of southern China, centred on the Yangze Valley, had developed a level of civilization to rival that of the Shang. Large, wealthy urban centres had emerged contemporary with Zhenzhou. They displayed a distinctive southern bronze work tradition, for example casting tigers onto handles of bronze vessels. However, they do not seem to have used writing, either their own or imported from the north. We have seen that the Shang political system formed a kind of confederation of states in which many semi-independent rulers acknowledged the overlordship of the Shang king. One of these states was the kingdom of Zhou, which lay on the western frontiers of the Shang-dominated area, and may not have been fully assimilated into it. At times it appears to have acknowledged Shang suzerainty, but at other times was amongst Shang’s enemies. In c. 1122 BCE (1045 BCE by some reckonings), the powerful and ambitious king of Zhou sent his army, which according to traditional accounts included 300 chariots, to defeat the Shang army in the battle of Muye. The last Shang king committed suicide in his burning palace. The victor moved the capital to the city of Zengzhou, and that period known in ancient Chinese history as the Zhou dynasty had begun.